The Hair Brush is a wonderful ceramic brush that straightens your hair easily without damaging or burning it. Perfect for hair of all types, this brush features ceramic-wrapped bristles that warm up quickly. It is the quick and easy way to get salon quality, perfectly straight hair. All you have to do is glide simply straight through your hair like a regular hairbrush, for beautifully smooth, straight hair in just minutes. The secret is in the special, ceramic-tipped bristles that warm up to just the right temperature and gently relax your hair as you brush. 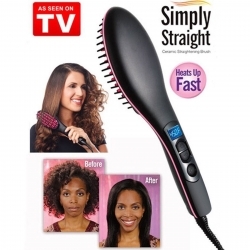 The Simply Straightening Brush is a quick and easy way to straighten your hair without damaging or burning it. No more flat iron damage, chemicals or hassle. Straightening your hair is now as easy as brushing it.